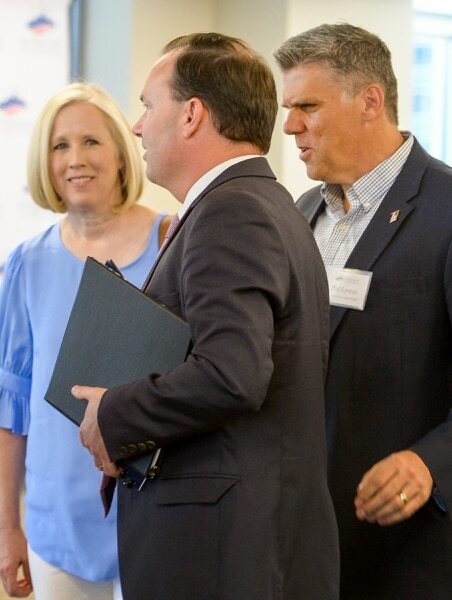 Leah Hogsten | The Salt Lake Tribune Sen. Mike Lee talks with San Juan County commissioner Phil Lyman and his wife, Jody, before Lee took the podium to talk about Utah's public lands at a forum hosted by the Sutherland Institute, June 29, 2018. Leah Hogsten | The Salt Lake Tribune Sen. Mike Lee, who is a former federal prosecutor and Supreme Court clerk, fields questions about the possibility of Lee filling the Supreme Court vacancy from members of the media after speaking about Utah's public lands at a forum hosted by the Sutherland Institute, June 29, 2018. Leah Hogsten | The Salt Lake Tribune Our long-term goal must be the transfer of federal lands to the states, said Sen. Mike Lee, at a Utah public lands forum hosted by the Sutherland Institute, June 29, 2018. Leah Hogsten | The Salt Lake Tribune Sen. Mike Lee greets Rep. Ken Ivory, R-West Jordan before Lee took the podium to talk about Utah's public lands at a forum hosted by the Sutherland Institute, June 29, 2018. Leah Hogsten | The Salt Lake Tribune San Juan County commissioner Phil Lyman, joined by his wife, Jody, talks with Sen. Mike Lee during a Utah public lands forum hosted by the Sutherland Institute, June 29, 2018. Leah Hogsten | The Salt Lake Tribune Our long-term goal must be the transfer of federal lands to the states, said Sen. Mike Lee, at a Utah public lands forum hosted by the Sutherland Institute, June 29, 2018. Leah Hogsten | The Salt Lake Tribune Sen. Mike Lee, who is a former federal prosecutor and clerked for the Supreme Court previously, fields questions about filling the Supreme Court vacancy from members of the media after speaking about Utah's public lands at a forum hosted by the Sutherland Institute, June 29, 2018. 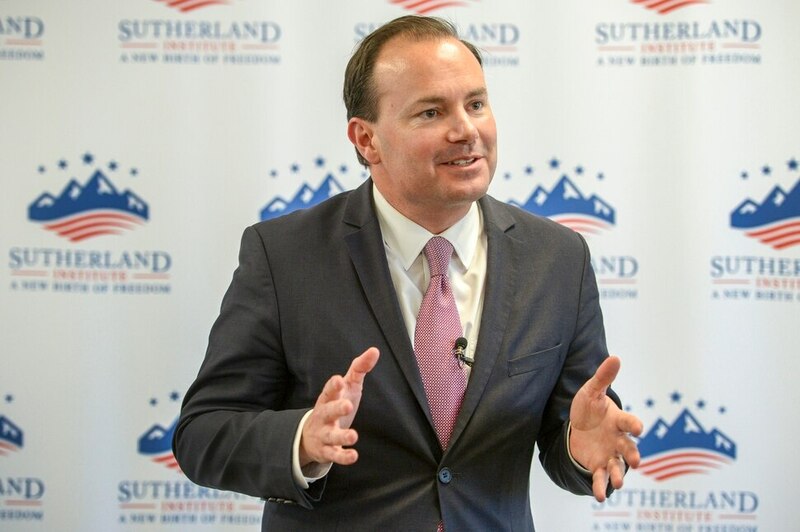 President Donald Trump on Friday praised Utah Sen. Mike Lee, who is on a list of 25 people from whom Trump said he would pick the next U.S. Supreme Court justice. “We’ve become good friends ... very good guy, very talented, very smart,” Trump said of Lee, who once was a #NeverTrump Republican and voted for third-party candidate Evan McMullin in the 2016 election. Lee on Friday said that the White House is now talking to him about the high court vacancy — with the announced retirement of Justice Anthony Kennedy — but declined to say whether the topic is about his own possible nomination, or about others. “That’s a private conversation,” he told reporters in Salt Lake City after a speech about public lands. But then Lee acted a bit like a nominee. Asked if as a member of the Senate Judiciary Committee he would like to see a nominee who would reverse the Roe v. Wade decision that legalized abortion, he dodged the question. Lee and his brother, Utah Supreme Court Justice Thomas Lee are both on Trump’s publicly released short list to replace Kennedy. The Lees are sons of Rex E. Lee, former U.S. solicitor general under President Ronald Reagan. 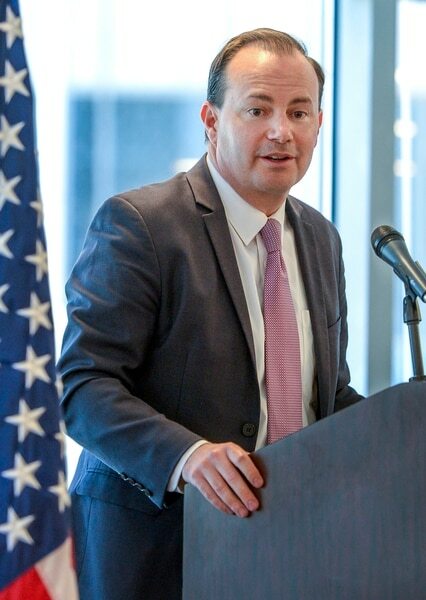 Mike Lee has said he would not turn down such a nomination if it comes, and would even vote to confirm himself in the Senate if needed in a close vote. Trump told reporters on Air Force One on Friday that he will announce his Supreme Court nominee on July 9. He said he has narrowed the field to about five, including two women. He said he plans to interview one or two this weekend in New Jersey. Lee’s office said he has no travel plans for New Jersey this weekend. Lee also said Friday that he would love to see his brother nominated — in part so that he could throw hardball questions at him during a confirmation hearing before the Judiciary Committee. Just before Lee dodged the abortion question that could doom any Supreme Court nominee, he gave a fiery speech to the Sutherland Institute comparing the federal government to an uncaring feudal lord that blocks access in Utah to federal lands except for the enjoyment of the elite. Lee said the current state of federal lands in Utah is akin to the royal forests created by English kings in Medieval times — where commoners were kicked out so noble elites could preserve forests for their own enjoyment and hunting. Now in Utah, he said, “The federal government’s vast estate is reserved in many respects for the enjoyment of the very few upper crust elite,” whom he said worked with environmental activists to slowly force out grazing, mining, timber harvesting and other uses by local residents. Those elites “envision a landscape dotted only with picturesque resort towns that exist for their pleasure. Destinations where they can jet in, spend a few days at a cabin, in the shops, take a few pictures of some animals, and then retreat to their elite enclaves on the coast,” he said. He complained that the federal government did not comply with language in the law that created the state to sell federal lands for private use, as happened in eastern states. But the federal government continues to own two-thirds of Utah’s land area. “Western states entered the union on inferior terms as tenants of a negligent and forgetful landlords,” he said. He vowed to introduce bills to transfer many federal lands to Utah, ban presidents from declaring new national monuments in Utah without approval by Congress and the state Legislature, and to reinstate the old Homestead Act to allow individuals and groups to petition to acquire land for homes, churches, schools and other uses. San Juan County Commissioner Phil Lyman — who spent 10 days in jail on his conviction for leading an illegal ATV protest ride onto closed federal lands — complained to Lee in a question that residents are often now deemed criminals. Why, he asked, are federal police agencies that sometimes use strong-arm tactics not considered criminals? Lee responded that he also questions “the quasi-militarized police” of federal land agencies. “I have yet to hear a persuasive, concise answer as to why [law enforcement on public] lands needs to be federal” instead of handled by local agencies.